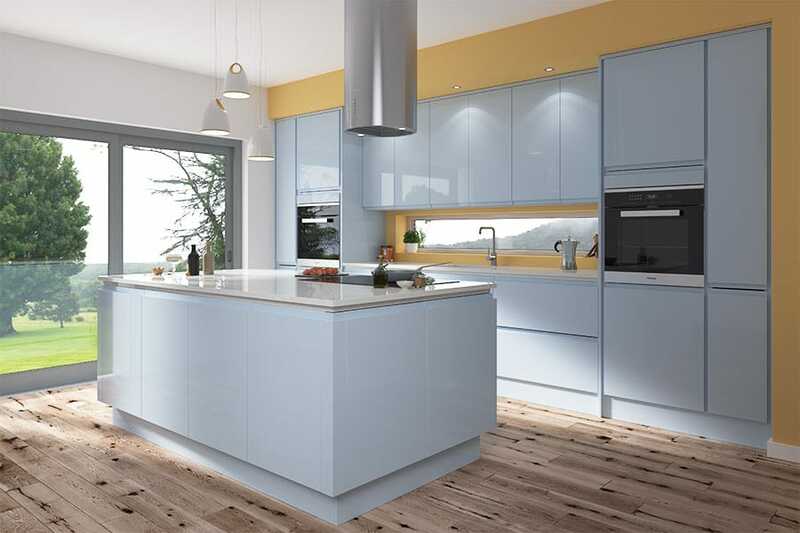 This is an Innova Luca High Gloss Sky Blue Handleless kitchen solution. Manufactured with a 22mm MDF door and finished with a high gloss polyurethane lacquer. 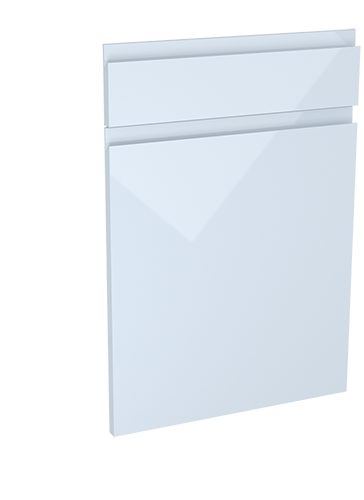 The Luca high gloss range is currently available in White, Alabaster, Dove Grey, Sky Blue, Sage, Cashmere & Graphite. With its clean lines and smooth appearance, this kitchen will bring a touch of class to any home. The process of finishing a true gloss kitchen door involves applying a high build polyester primer to the surface, sanding it, then applying a gloss polyurethane lacquer. Finally, some more sanding is required then buffing & polishing with compounds and waxes to achieve that glossy finish. I am in my 70s and keen on DIY, I decided to refurb our kitchen but keep some of the existing cabinets. The most scarey jobs were mitering the worktops, there were 3 joints and boring the lovely new doors to fit the hinges, however after a few practice runs on the old ones all went well. DIY kithens were helpful with submitting the order and everything was correct except some drawer fronts which was my mistake, they were changed without any problem. The quality of the kitchen is very high, we are particularly pleased with the finish of the "Luca" style doors. Because we thought unloading the 4 meter worktops may be too much for us we paid a bit more for the delivery, 2 great guys put everything exactly where we wanted them, the worktops even came in through the window. Everything went very smoothly my only advice to anyone undertaking DIY fitting is don't do it over Christmas! Regards Eric, thanks for everything. Please use any of the attached photo's that you want. The kitchen is in a mobile home and has transformed the whole place! Everyone who has visited has commented how much they like it. The units arrived, as requested, with the doors attached which saved a lot of work for me, the units are all made from heavy grade materials, no hardboard here, the finish is superb. My wife absolutely loves it! Please find enclosed pictures of my recent kitchen from you. Fantastic range of units available and great colour choices. 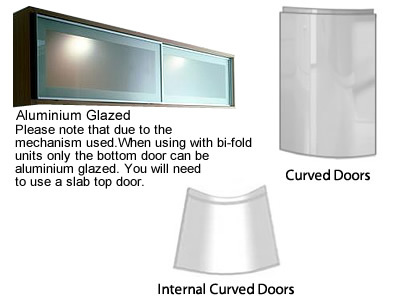 The gloss doors are easier to maintain, just wipe with a cloth. The cupboard units came already made which made installing the kitchen a lot quicker. The handless cupboard doors gave our kitchen clean lines and a modern Touch. Fantastic kitchen, first class service. I was especially happy with the quality of the cabinets and doors; better than any I've seen anyone else install over the years. I think that the corner floor cabinets could support a tank! Very well made and robust. 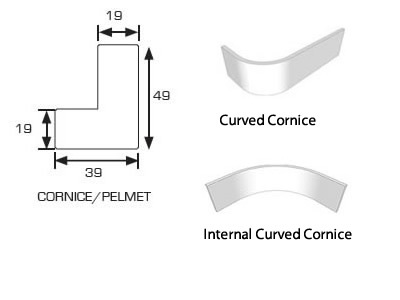 The corner curved units I especially liked for my open plan layout and the matching panels made it easy to have a curved worktop breakfast bar. I installed the kitchen myself (joiner did the real wood worktops) and it was a breeze. Just had to be certain of the dimensions, that was the only bit I checked three times before ordering. Really really impressed and would highly recommend. My photos dont really do it justice but you get the idea. I first heard about DIY kitchens from a friend who was singing their praises so I researched to death various suppliers, via Google, and ended up ordering from DIY Kitchens anyway. Hopefully you like my photo's and use them and send me some cash! Many thanks again, well impressed with your units and service. Order a Luca Gloss Sky Blue door sample pack Pack contains x 1 355mm x 297mm 'Luca Gloss Sky Blue' door. Fully refundable when placing a full kitchen order. There's no risk to you, we'll collect and refund the samples once you have finished with them.